Running Free. Slow, but free. My least favorite thing about being pregnant was the lack of mobility. Obviously, my ever-growing belly was a hindrance, but the real bothers were the other medical issues that came up. Due to pain or actual doctor’s orders, I was forced to restrict movement – much more so this pregnancy than with my first. While certainly annoying for someone who has a hard time sitting still, I kept myself busy instead by planning literally every day up to my due date. Exercise was reduced to short walks with the dog and 30 minute spinning sessions on a recumbent bike. I made a conscious effort to change my outlook on exercise for the remainder of the pregnancy. Rather than pushing my body to get faster, stronger, or leaner, I had to act like a 70-year old woman with heart problems and exercise for nothing more than getting my circulation flowing. With both of my pregnancies, I’ve struggled with accepting weight gain. 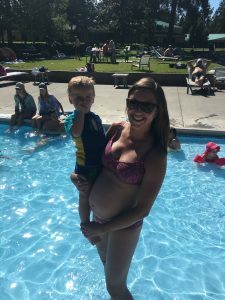 Even though I gained within the recommended amounts, and even though I knew that gaining weight in pregnancy is an absolutely essential thing, I still battled with the concept. Only months before, I’d been in the best shape of my life and running faster than I ever had before, which irked me to no end. The fact that I couldn’t exercise how I wanted to just messed with my mind even more. After having a beautiful and completely perfect little boy at the end of July, I struggled to push the longing to the side. Yes, I was super excited, albeit exhausted, with the addition of a newborn to an already crazy toddler life. But man-oh-man, I so wanted to get back out there. However, I knew I wasn’t ready. I tried to really focus on embracing my mama role and pretend like I wasn’t even thinking of getting my post-baby body back out there. But as my body healed and I began to settle into the new normal, the yearning to run returned with a vengeance. I began a new count-down. September 10th was the six-week postpartum mark on my calendar – the length of time most doctors wait to clear their patients for exercise. I walked and did some light hiking, but saved that circled date on my calendar for my first run. Ok, that’s a lie. I did do plenty of walking and light hiking, but that wasn’t enough. I was sick of pansy modified workouts and just wanted to run. I needed to feel like an athlete again. So, I didn’t wait. 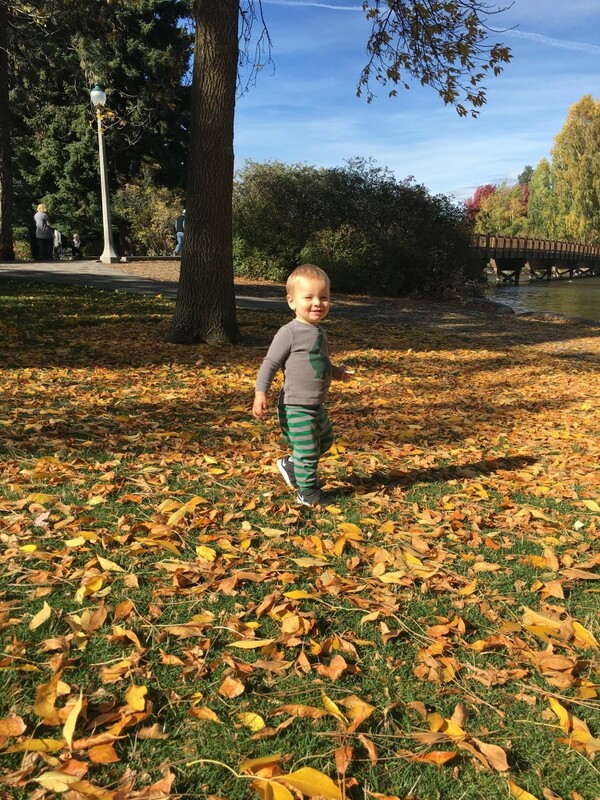 I started running about three weeks postpartum. Not far – just a little jogging here and there in the middle of my walks. But come week five, I really felt ready. I charged up my iPod and wore workout clothes that wouldn’t have fit just weeks before. As I stepped out of the house and onto the pavement, I felt the nervous excitement of a kid on the first day of school. I almost felt like I was being watched. If anyone had been watching, they would have wondered what the heck was wrong with me. I almost couldn’t remember what to do. Do I warm up? Am I supposed to stretch? Still donning my medical grade compression stocking and feeling anything but athletic, I took off. The first steps felt awkward, but I quickly found my stride. I cranked the music and, for the first time in almost five months, was able to run. I ran. I kept running. I started going faster. I felt like a dog that had been let loose in a big field after being trapped in a crate on a long car ride. More confident and more free than I’d felt in months, I ran six miles. You know that overwhelming happiness and elation that hits so hard that it feels like your soul is going to just jump out of your body? Those moments where you’re sure you’ll explode in a big frenzy of euphoria? That’s what that run felt like. It’s the same feeling of insane contentment I get when I’m in the midst of a breathtakingly beautiful mountain view or when my kids do something adorable. Those moments are life giving. They counter bad news and crappy days and rush hour traffic. They have the power to turn an entire day around and enough influence to stick with you a long time. They say the more you live, the less you will die. Stuffing my life with as many of those moments as possible is a good place to start. Is there anything better than watching a dog run down a trail? They move with such enthusiasm and wild abandon, barely able to contain their excitement as they sniff each turn in the trail. Unlike humans, dogs don’t attempt to control the outward manifestation of their feelings to avoid looking awkward. Just watching their endearing expression of pure joy and wonder is enough to put a smile on your face. In honor of National Dog Day on August 26th, I thought I’d spend this post on our favorite four-legged friends. Shortly after Derek and I got married, we started talking about getting a dog. We were set on rescuing a shelter dog, so we kept our eyes open. One day we went out to “just look at” a pair of dogs at a nearby pet foster facility. These two little pups were from a group of 30-something dogs that had been rescued from a puppy mill in Eastern Oregon. Both were adorable, but one loved us immediately. She ran up to us, let us cuddle and pet her, and looked like she would just be the happiest girl in the world if we took her home. After falling in love, the staff person then informed us that shelter-named “Heather” had been claimed already. If we were still interested, her sister was actually the available dog. We turned our attention to the other dog, “Meisha”. This little scoundrel had sprinted out of the gate as soon as it opened and was frantically sniffing everything in sight, swiftly and playfully running away as soon as any of us got close. When we caught her, she just wiggled around uncomfortably like we were restraining her from all the wonders of the world. Despite this first impression, we ended up going home with that sweet girl that day. She settled down immediately once we were in the car, then promptly puked on my lap. We stopped at the store on the way home to get all the puppy necessities, then proceeded to get this new pup – now named Tonka – used to life with us. Before we had kids, Tonka was our kid. She definitely lived the high life. Having kids has changed things a bit. In short, she’s had to get used to being an actual dog. 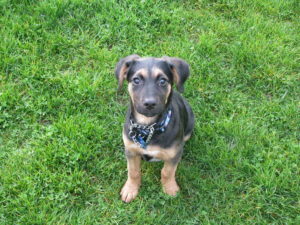 Luckily, she hasn’t spiraled into a dark emotional state or succumbed to puppy depression. I still take her on walks daily, and she hiked just about every hike in Day Hiking Bend & Central Oregon with me. She loves chasing Rowan around and, unfortunately, eating his diapers when she gets the chance. I could write an entire book about Tonka’s silly and mischievous streaks, but that’s for another day. The bottom line is that this sweet rascal has been the perfect dog for us. She’s a little crazy, but such a lovey. She’s always up for adventure, and we’ve come to terms with the fact that she will probably never greet us calmly. My dad, having observed his two dogs hop in the car countless times, mentioned once how he always wonders what they’re thinking when the door shuts and the drive begins. Besides little cues, like whether the trunk is filled or empty, dogs have absolutely no idea what’s in store for them. They don’t know if we’re taking them to a park, to the vet, or on a weeklong camping trip. They just hop in and trust us, knowing that home is wherever their owners are. Dogs are just along for the ride and probably could teach us a lot about life if we really took the time to think about it. Happy National Dog Day, everyone. It’s July, and it’s hot. And I’m pregnant. And uncomfortable. My husband is a saint for sticking with me over the past nine months. I haven’t quite been myself, and I’ve had more low moments this pregnancy than I ever have in any other year of my life. One of the most embarrassing ones happened when I yelled some pathetic defensive comment at a snarky little middle school boy who was making rude comments to his friends and shooting disgusted looks my way at the gym. I’m definitely not proud of it. I know I’ve been writing a lot about pregnancy and parenthood, but it’s inevitable that we all tell stories through the filters of our own lives. This is the stage of life that I’m in right now. Sometimes (especially right now), I’d like to fast-forward and move past the uncomfortable parts. But life is hard sometimes, and the tough stuff makes us stronger. While this pregnancy has been harder than the first in many ways, the most annoying has been the severe varicose veins on my right leg. It’s been medically verified that they’re deficient and diseased at this point, but until I deliver, there’s little I can do except wear full-length compression stockings to aid circulation. Even with the fancy sock, my veins are painful, itchy, and swollen all the time. I’ve been trying to figure out how these stupid varicose veins on my right leg are supposed to make me a better or stronger person, especially when they grump me to no end and prevent me from getting the exercise my neurotic self needs. Plus, wearing long skirts or pants to cover them up is getting pretty dang hot. The last month of pregnancy is sweaty enough without wearing a second pant leg in the dead of summer. After throwing a pity party for a few months, I finally decided to change my attitude and choose joy. This is a conscious decision rather than some momentous change in my circumstances. I can’t wallow and sit still all summer, because you know what? I’m the one at home with our two-year old. I’m not going to let my temporary frustrations squash the excitement and joy that Rowan wakes up with every day. Bringing joy to a two-year old’s world also includes abandoning all pride. So, instead of suffering in long pants, I’ve been unashamedly rocking my compression stockings with shorts, at the swimming pool, and while floating the river. I’ve realized that it just doesn’t matter. It doesn’t matter if I’m uncomfortable, in pain, or feeling kind of gross about myself. It doesn’t matter if it looks like I’m carrying a watermelon in my stomach or that I waddle when I walk. It doesn’t even matter if a puberty-ridden teenager is visibly repulsed by me. Because you know what? 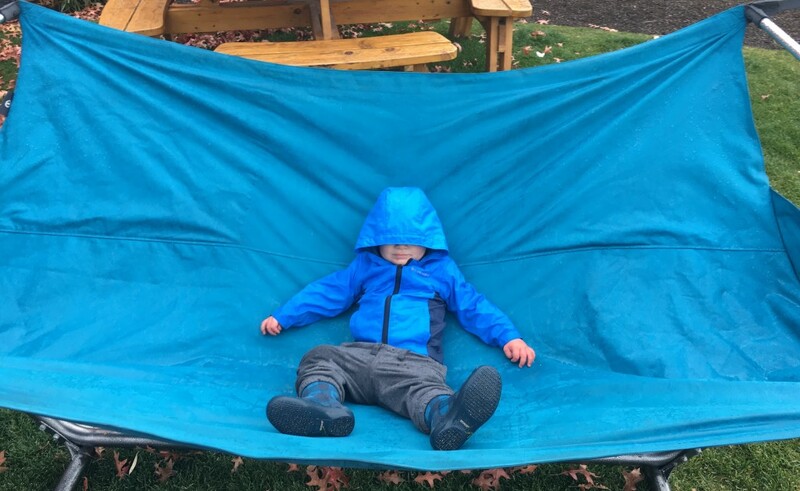 My two-year old doesn’t care, and he’s what matters. He won’t remember that I had gnarly ropelike purple veins protruding from my right leg. He doesn’t notice that it’s hard for me to sit down on the floor next to his Legos, or that it’s even harder to get up when he sprints away towards the open back door. He won’t remember that I wore a sports bra, running shorts, and compression stockings at the pool instead of a swimsuit. He’s not comparing me to anyone else, and he won’t remember if I was feeling a little self-conscious, exhausted, or less than myself. He’ll remember that when he tenderly called out “Mama?”, I came to his aid. He’ll remember floating the river with his parents and running the rapids a few days before they closed them for safety issues (oops). He’ll remember splashing me in the pool and laughing hysterically as he sprinted up and down every hill he could find. He’ll remember getting out of his stroller, grabbing the dog’s leash, and running wild on the local trails. He’ll remember me taking his extended hand and following him on whatever adventure he had in mind. That’s what he’ll remember. Or not. I mean, he’s only two. I’m lucky to have an incredible husband who absolutely loves being a dad. I’m equally lucky to have a dad of my own that set such an amazing example of what a good husband and father looks like. I could write pages and pages on each of them, but I thought I’d take a different approach to Father’s Day. Instead of talking about how awesome these two men in my life are, let’s chat about kids. You know – those things that give a normal guy the life-long, pressure-packed, and incredibly fulfilling role of father. I’ve been looking forward to kiddo number two for a long time, and not just since the first one. Derek and I always knew we wanted two kids. We each grew up with a brother, so the idea of stopping after one kid wasn’t something we even considered. Being the crazy planner that I am, my ideal world even outlined that these two kids would be two-ish years apart – just like each of us are from our brothers. Luckily, I’m not insane enough to plot out which gender combo I’d prefer. After having Rowan, we were equally excited about the possibility of him having a brother or a sister. Our hearts were incredibly full from the moment Rowan entered the world. I knew we’d have that second child someday, but since it wasn’t eminent, we didn’t hold back on any of our original plans. At a year old, Rowan had already taken 18 plane rides, including a few cross-country trips and one cross-Atlantic one. 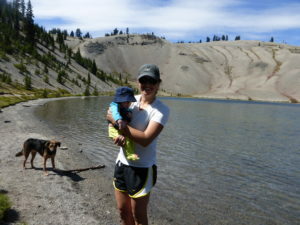 He came along on just about every hike for Day Hiking Bend & Central Oregon and learned to crawl on our winter trip to Brussels, London, and Amsterdam. 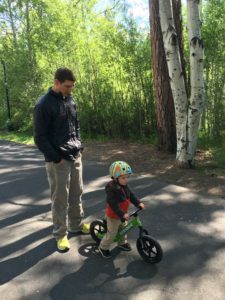 While we’ve definitely had to adjust with a child, he never slowed us down. I knew that we were doing things with him that the second kid probably wouldn’t experience, but Rowan probably wouldn’t remember it anyway. I started thinking ahead to all the highlights from my childhood and how I could give him the same memories. I’m so looking forward to taking him rafting and skiing, or watching him summit South Sister on his own two feet instead of in a backpack. I can’t wait to go on family bike rides and watch his sporting events. Whenever I’d let my mind fast-forward to those amazing future memories, I’d picture that faceless little brother or sister who would be part of our family. I’d picture all the crazy adventures that we’d attempt with our little family of four and all the memory-making mishaps that would occur – those kinds that are frustrating and scary in the moment, but make for excellent stories later on. Our family has never felt empty or lacking, but at the same time I knew that when the second kid arrived, it would be whole. That second little child will arrive sometime in early to mid-August. I know it will be another adjustment, but I’m beyond excited for another new beginning with this addition. I’m excited for the mountaintop family photos, camping trips, and simply watching two perfectly crazy little kids witness and experience all the wonders of this world for the first time. Arbor Day is coming up. Outside of elementary school planting parties, I doubt I’d ever “celebrated” this “holiday”. I do not have a green thumb. I’m not sure if it’s the lack of patience, knowledge, or equipment, but issues often develop after I try to plant something. When we lived up in Olympia, we planted quite a few deciduous trees to complement the giant evergreens our yard backed up against. They grew nice and tall, with big leafy foliage. All was well in our little backyard oasis. Unfortunately, a few years later, one of the trees had grown so tall that it was just entirely out of control. It was pretty apparent that we should have been regularly pruning those big upper branches. Fast-forward to a winter storm, and the entire thing blew right over. I guess we didn’t plant it deep enough either. Another tree, a pretty maple, flat out died on us, seemingly without cause. We noticed one spring that the leaves just never came back. Lazily, we just left it there, as if it would somehow spring back to life the following year. It didn’t. It just sat there in the dirt like a sunken ship’s decaying mast in the sea. We did have some success, though. Hydrangeas, blueberries, rhododendrons, ferns, and a few other varieties thrived in our wet Pacific Northwest yard. Were we more diligent to fertilize these fellas? Nope. Did we carefully and lovingly prune them? With the exception of one hacking to the hydrangeas during winter, never. The difference was that the habitat that these species needed for proper growth was especially agreeable to the conditions in our backyard. Since then, we’ve been big proponents of planting trees and shrubs that are natural to the area. Luckily, our friendly Forest Service makes this incredibly easy. Did you know you can get a permit to transplant native plants and trees into your own backyard? For free? You can! Availability probably varies depending on the area, but this awesome program still exists within the Deschutes and Ochoco National Forests. 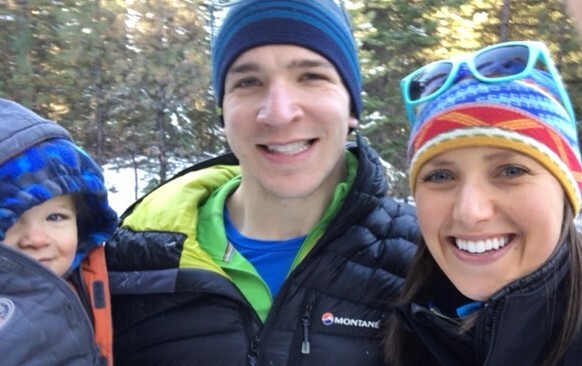 A few weeks ago, we headed into our local forest service office and got our permit. The free permit is good for a three-month period and allows for the holder to collect up to 16 plants – four trees and 12 shrubs. Should you need more than your permit allows, you can pay extra for a supplementary permit that allows for additional quantities. Commercial use requires a separate fee. This little manzanita is the perfect size for transplanting. And don’t judge us…it’s not a real phone. Obey posted signs. Almost the entire forest is fair game, except for recreation areas. Collect at least 100 feet from roads and bodies of water. Only collect from species listed in the brochure. Trees must be seedlings under four feet tall, while shrubs need to be under two feet tall. Fill in holes and make the area look natural after digging. Update your permit quantities and keep it with you while collecting and transporting. When you’re ready to start plant hunting, grab all your supplies, including your Deschutes National Forest map. Bring burlap and twine to wrap each plant so the roots don’t dry up in transit. As you start digging, refrain from getting over-zealous. With almost every plant we moved, roots were much deeper than we thought. Stick to the height restrictions outlined in the brochure – you’ll be way more successful with both digging them up and getting them established in their new home. In Central Oregon, the landscape’s lineup is severely desert-like. High elevations, harsh winters, and less rain means plenty of green and brown plants and fewer colorful flowers. We split our hunting up into a few different trips, exploring different locations within the Deschutes National Forest to try to snag different types of species. 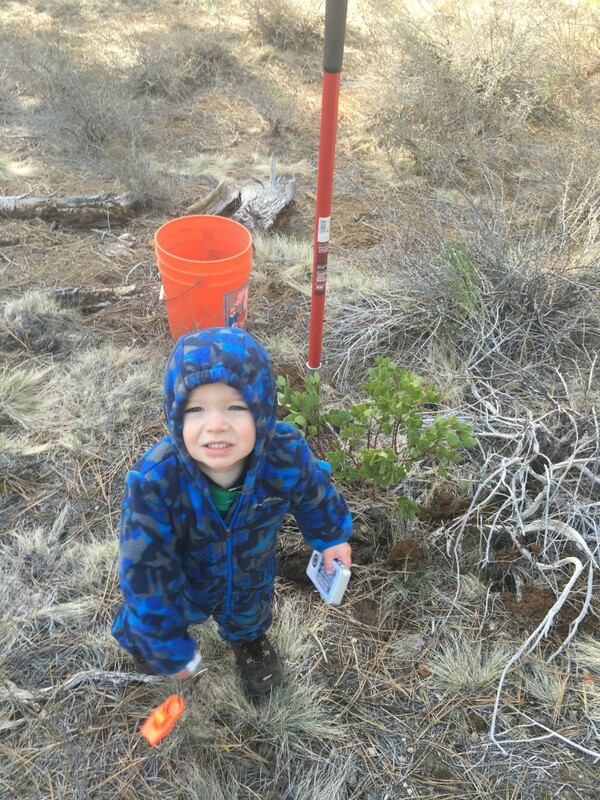 We found a cute little juniper tree seedling, a couple of pine trees, Manzanita, and grasses. To supplement our new desert landscape, we went to a gardening store and picked up a big bag of wildflower seed. They’re super easy to plant, and it’s an extremely natural looking and economic way to add blooms to your yard. I have no idea if the varieties in this bag are supposed to grow here or not. I guess we’ll see. The bottom line is that if you stick to native plants, you’ll be giving your yard a head start on successful growth. You might even convince others that you have a green thumb. Have fun bringing a little more nature into your backyard! Happy Arbor Day. I’m itching for summer. Not even summer, actually. Moderately not-freezing temperatures and a few days without snow flurries would be enough to lift my spirits. But, alas, it’s still winter. I can’t really complain, nor can I argue with the calendar. While we’ve had a few sneak-peeks at the springtime thaw, it’s anything but temperate out. The weather is playing by the same rules it always does, but this year it’s bumming me out. Things weren’t always this way. When I was a kid, winter meant snow days, Christmas break, and ski days with family. This fancy-free life lasted through college. When school ended and a “real job” began, things changed. Other than the occasional ski vacation, we mostly had to become weekend warriors. We prayed that powder days would coincide with our days off. When they didn’t, we’d cross-country ski the trail system near Mt. Rainier or take a cold and rainy hike in town. Basically, we made the best of it. We took every chance we could to get outside and play, because time was limited. But something changed when we had kids. We decided pretty early on that I was going to stay at home with the kids. Lucky for me, I’ve started a career that I can mostly do at home. Unlike a traditional office job, I actually have the flexibility to get outside during normal work hours. Despite all the “free time” I have during the day, it’s been hard this year to feel the joy of winter. Kids just change things, and I’m pregnant with kiddo number two. I’m not allowed to ski past a certain point, so as to make sure I don’t fall and hurt the baby. Plus, getting out with a toddler is a circus. 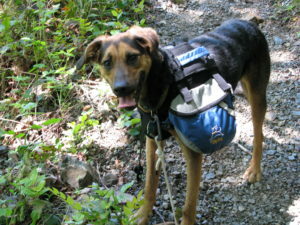 There are diapers and snacks to haul around, naptimes to coordinate with, and a dog to keep track of at the same time. Don’t get me wrong; I’m completely happy with my role, and we do get outside a lot. And please trust me when I say it’s not an issue of being a fair-weathered parent. 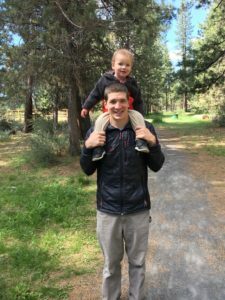 I dragged my poor son through the elements almost daily while writing Day Hiking: Bend & Central Oregon. To this day, he loves putting on his boots and tromping around in the rain. He’s used to dirt under his nails and mud on his shoes. He’s an adaptable little kid, but it’s still a kid. As much as I can bundle him up, there’s still a limit to how long a toddler can withstand winter winds and sideways sleet. When the ground is as slippery as a skating rink, sometimes it seems easier to figure out something to do inside. Luckily, there are lots of ways to still get outdoors in Central Oregon, even in the middle of winter. Start by heading east. The eastern side of Central Oregon is lower elevation, drier, and more exposed. It typically retains less snow. Check out the Badlands Wilderness Area, Maston Area near Cline Butte, or the trails around Crooked River Ranch. Note: Carrying your kid while snowshoeing or skiing is generally not a good idea. It’s not super safe due to slippery conditions, higher speeds, and the cold weather. 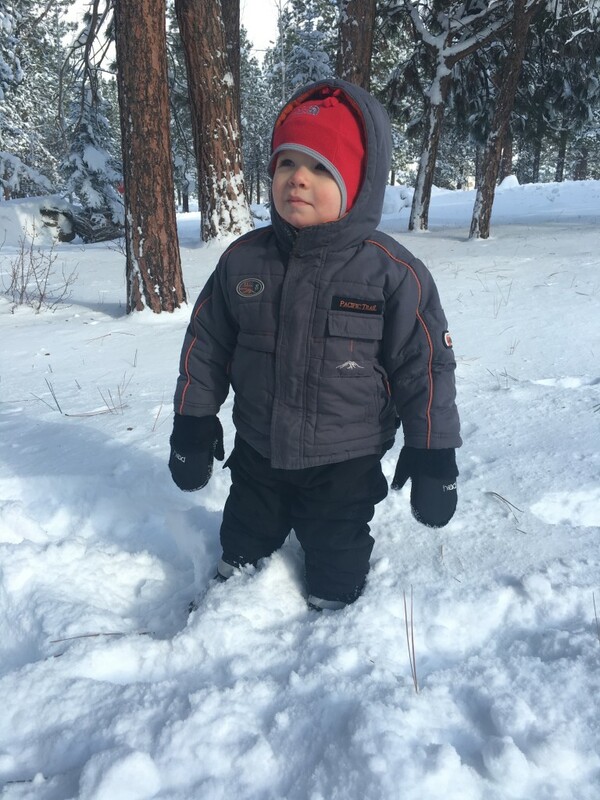 Better to bundle your kids up and find a natural area for them to run around. If you’re trying to wrangle a toddler and a dog at the same time (and if your kids likes dogs), take a walk from the Good Dog Trailhead. 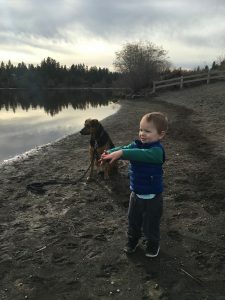 Everyone can run around off-leash, and the trails connect to the Deschutes River Trail. Plan on doing more playing than hiking. As the months go by and the sun beats down on winter’s leftovers, new terrain is exposed. Early spring is a good time to scope out lower elevation waterfalls as they trickle into rivers below. 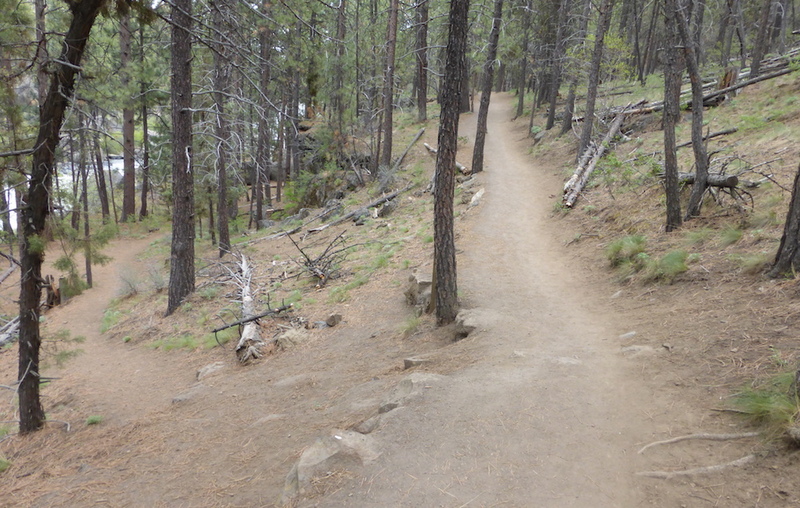 Despite the damp conditions, early hiking season in Central Oregon is typically still a tad too cold for mosquitoes. Don boots that you don’t mind getting sloppy, but leave the deet at home. Each week reveals new possibilities and areas to explore. Bolstered by snowmelt in late spring, lakes get deeper and rivers get wilder. 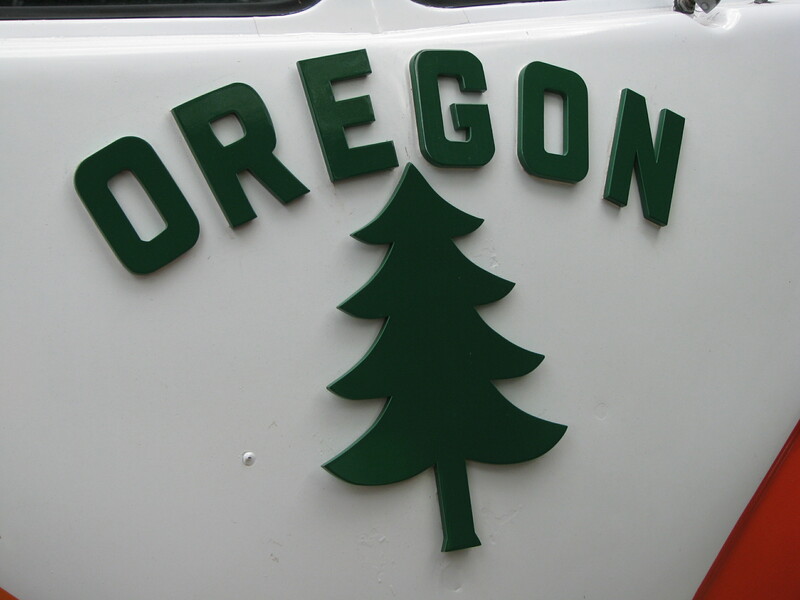 Major recreation roads, such as Cascade Lakes Highway and McKenzie Pass, typically open in June – sometimes in May. This doesn’t guarantee that the trailheads are accessible, but once the snow gates are open, you’re welcome to explore. Start with the lower trailheads and move your way up in elevation as the days get warmer. I’m happy to announce that getting outside in Central Oregon is going to be even easier this summer, as my new guidebook will be coming out just in time for the start of hiking season. Look for Day Hiking: Bend & Central Oregon online and in stores a little before Memorial Day. Get your preorder in now to get one of the first copies as soon as it’s released. With up to date maps, directions, specs, and descriptions, it has everything you need to explore this area’s most beautiful hikes. Enjoy the last week of winter! I don’t really like New Year’s resolutions. Yes, they can be useful, and people do make big life changes every year due to the declarations they made in January. But for me, resolutions have always had an air of inauthenticity to them. They’re lofty and unrealistic without a plan to complete them. The other thing that bothers me about resolutions, is that mine don’t really change year to year. Abraham Lincoln said, “Whatever you do, be a good one.” Among many other things, I am a wife, mom, writer, and athlete. No matter what progress I made in any of those categories the year before, I will want to strive for more growth over the next year. Sure, some of these we were going to do anyway. But the point is that by writing them down, you are more likely to keep improving and growing. Plus, you get to cross them off! Yes, I’m a planner, and I like to get things done. However, having kids has a way of derailing even the best-laid plans. I thought my dog’s hourly need for physical activity was intense, but it was nothing compared to what my crazy energetic son had in store for me. The sweet little toddler boss roams around the house in wild abandon, undoing things I’ve already checked off and creating new tasks faster than I can write them down. He’s a great sleeper and overall a really easy kid, but man that kid can wreak havoc! By the end of the day, I’d be a frazzled mess, he’d still be crazy, and I would have completed maybe one thing off my long to-do list. I eventually realized that our best days were the ones where I put his needs completely first. That meant getting outside and letting him run to the mailbox, in circles, or straight down the trail as fast as he could. Letting him climb up the steps and go down the big slide. 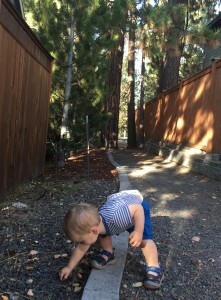 Being ok with him digging in the dirt, picking up rocks, and jumping in puddles. Letting him yell and squeal and laugh like his tiny hyper body needs to do. Once he gets that energy out, he’s a different guy. He’s content, constructive, and cooperative (at least most of the time). And you know what? I’m able to get a few things done because of that. I’m just like him, so it’s actually pretty pathetic that it took me so long to figure this all out. Since Derek and I love being active outside, we’re actually already pretty good at making sure Rowan has plenty of time to just be a kid. I mean, he went on nearly 100 hikes with me last year! But that was one of my to-dos. Making his exercise and play a priority over my to-dos is where the difference lies. That’s why I’m changing my strategy this year. While I do have a big list of things that I hope to accomplish in 2016, my day and my to-do list are no longer all about me. Etc, etc, etc. Hopefully I’ll keep adding and keep crossing off items here as we do more and more fun stuff throughout the year, until it just becomes habit. Having kids has a way of making even the most organized people feel like they’re constantly picking up the pieces. But it also has a way of putting everything in perspective. And for me, this year is taking on each day with the enthusiasm and adventurousness of a child. I like things in their proper time. Dessert comes after dinner. “Back to school” clothes are for after school has started. Work hard, then play hard. It’s not that I don’t like spontaneity, because I do. But respecting timing boundaries on things that are special is what makes them special. The more you get what you want whenever you want it, all the time, every day, the harder it is to be impressed. If you took your kids to Disneyland every weekend, how long before the novelty wore off? If we ate dessert non-stop, would we savor each decadent bite, or just shovel it down without thought? This kind of thinking is ingrained in me, and as such, I’ve always gotten irritated when I see Christmas décor popping up in the stores shortly after summer. It seems like it gets earlier every year. Sure, Christmas is amazing, but it can’t be Christmas all the time. And I’m a firm believer in leaving Christmas until after Thanksgiving. But once the turkey is stripped down to a pile of bones and everyone starts changing into their stretchy pants, game on. The day or two after Thanksgiving, my family heads out to pick out our Christmas tree. For the past ten years or so, we’ve skipped the farms and supermarket stands in favor of the wild growth in the nearby National Forests. Trees are abundant over here. Like, really abundant. 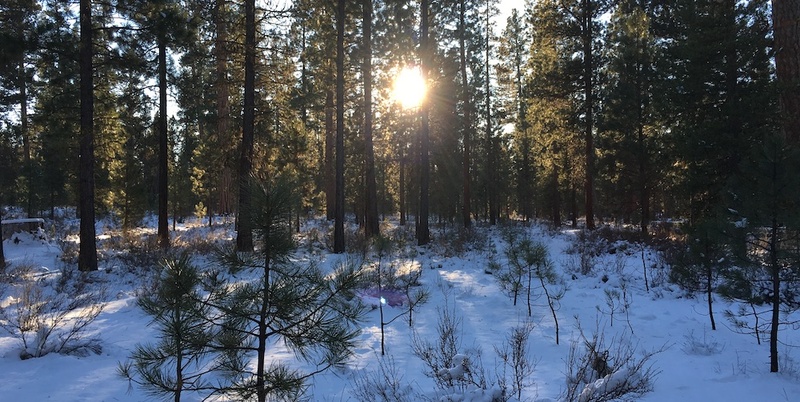 Nearly all common Christmas tree varieties can be found in the Deschutes and Ochoco National Forests, including Noble, Silver, and White Firs; Douglas-Fir; Cedar; and Lodgepole and Ponderosa Pines. All you need to do is pick up a $5 permit from one of the designated retailers. You’ll receive an orange tag, a zip-tie to attach it to your tree, tree-cutting guidelines, and a map detailing the general whereabouts of each tree type. 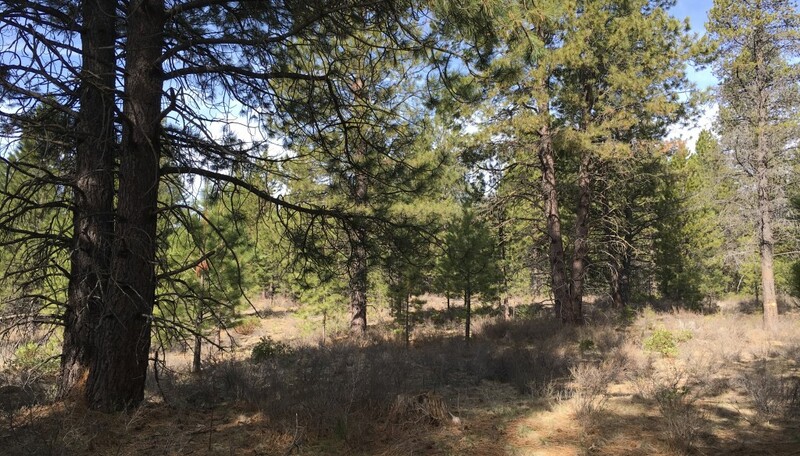 Most lands in the Deschutes and Ochoco National Forests are fair game, but be aware of private property. Obey any posted closures or restrictions that may apply to a particular area. Cut at least 150 feet from state highways, picnic areas, and campgrounds, and at least 300 feet away from streams and bodies of water. Also avoid any areas where new seedlings have been planted. If you have a certain tree species in mind, you might choose your location based on where that type flourishes. The map that came with your permit will point you in the general direction, but you may still have to hunt a bit if you’re looking for something specific. Pines are pretty easy to find; firs are a bit trickier. 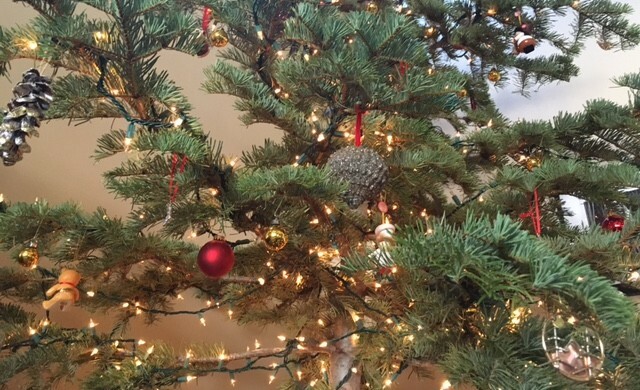 We were looking for a Noble or Silver Fir – something with a standard Christmas tree shape but enough spacing between the branches to let the ornaments hang easily. Those fellas are usually found at higher elevations, so we started up Cascade Lakes Highway to begin our search. About 50 miles from Bend, we turned right where Century Drive/Forest Road 42 crosses the highway. This is normally one of the bumpiest roads in the state, but with a soft cover of snow, most of the bumps had been filled in. After driving a ways and turning left on a side road, we parked and set out on foot. As you look for your tree, make sure it meets the Forest Service requirements. The tree must be less than 12 feet tall and located within 15 feel of another tree. Make your cut as close to the ground as possible, ensuring that you do not leave a stump greater than 12 inches. After cutting down your tree, safely attach it to your vehicle and affix the orange permit tag to a branch. Punch in the numbers for the day you cut it down and make sure it is visible so that rangers and sheriffs know you cut your tree legally. We found our tree pretty quickly, as it was literally bathed in a warm sunbeam and illuminated within the forest. This pretty fella was a nice Noble Fir, about 11 feet tall with full foliage and fairly symmetrical branch spacing. Perfect! After cutting it down, we carried it back to our car and strapped it on top, then attaching our permit. When you get your tree home, place it in fresh water as soon as possible. Freshly cut trees are thirsty, and getting it hydrated quickly will ensure it keeps its needles longer. The bigger the tree, generally the thirstier it will be. You’ll probably fill up your tree stand’s reservoir multiple times a day over the first few days. Decorate with lights, ornaments, or whatever else you please. Putting up a tree always brings me so much joy. After a day out in nature, it’s a fun feeling bringing a piece of it back into our home. Waiting until after Thanksgiving allows me to be fully present during that holiday before moving onto the next. Respecting the boundaries protect this tradition and allow us to fully experience them in their proper time. Having my sparkly and fragrant tree for only one month a year is what makes it special. Plus, clutter makes me a little crazy. Once Christmas is over, I’m ready to chuck my tree in the yard-debris bin and move on again. Because even with our favorite things, the novelty wears off if we don’t respect boundaries to keep them that way. I’m not a “live in the past” kind of person. Not because my past is bad (it isn’t), and not because I’m always living in the present (I’m not), but mostly because I’m always jumping ahead to whatever’s next. But every now and then, I get the itch to backtrack into old memories. We recently had to go to the valley for work, which we were able to tie into a nice long visit with family and friends. With so many people fighting for time to hold the little guy, it’s easier to find a few spare hours to get out on a good run or hike. Little-miss-multitasker that I am, a nice wet run in the valley was also a perfect opportunity for me to test out a big stack of rain gear for Washington Trails Magazine. Unlike the times where I’m training for a race, I didn’t have any type of plan for this run. As I headed out from my in-laws’ house, I turned left to head toward the city’s limits, outside of which there are sprawling country roads and less traffic. But as I ran, something didn’t feel right. It might have been uncomfortably big raincoat (which I promptly dropped back off at the house), or maybe it was something else. But suddenly I had an urge to run toward the traffic, through stoplights, and straight down memory lane. I felt like there was an inexplicable force begging me to revisit old streets and relive old moments. This urge hits me every now and then, not out of regret or disappointment, but purely out of a desire to celebrate and revel in the memories that I so love. So, I ran. I ran farther than I planned. 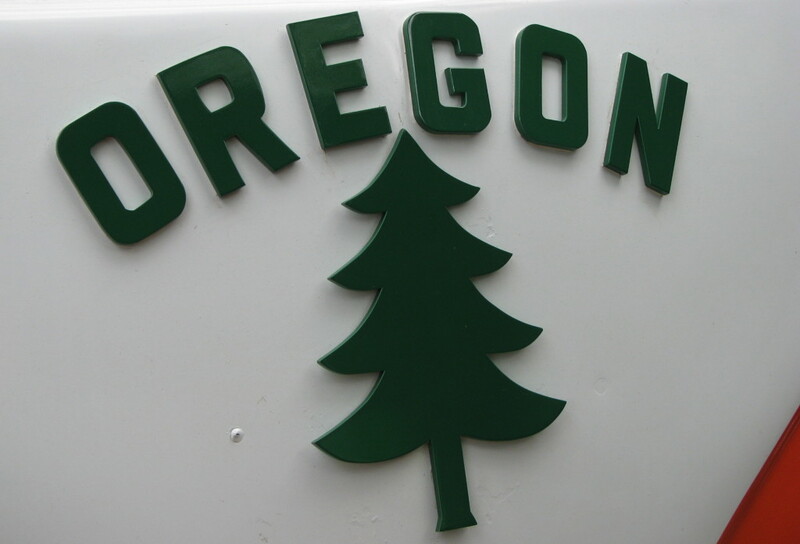 I ran down one of the main city streets, past downtown, and all the way to University of Oregon. I weaved around my old school, past old classrooms and restaurants, along the river I used to ride my bike on, and finally through the heart of campus. By now the rain was really coming down, but somehow I just couldn’t stop. I was keeping a pretty quick pace, and I just couldn’t tear myself away from this surprise wave of nostalgia. Every drop on my face brought the memories alive a little more. I ran by all the places I lived during my four years at UO, including the “University Inn” dormitory, a huge house across from the old Civic Stadium, a loud townhouse, and finally to charming little place in the neighborhood beneath Hendricks Park. Knee deep in nostalgia, I fell victim to the same cliché we all do as we get older – time goes by so fast. My heart-rate started to rise and my pace quickened as the urgency of it all hit me like a ton of bricks. What am I doing?? I need to do _____! I need to go _____! I need to teach my son how to ____!” But as I continued on, something hit me. While much has changed in my own life since those four wonderful years earning my degree at the UO, running through campus really feels no different than it did six years ago. I’ve changed, buildings have changed, and the people have changed, but the general spirit is just as I remember. Somehow that realization turned things on it’s head; in that moment, time felt like it had significantly slowed down. While man-made things rarely inspire the same sense of awe and wonder as the God-made elements of the natural world, I felt a parallel connecting these two domains. Just like the unchanged vibe of campus did for me on my run, the constants in the wilderness fulfill a longing that somehow forces us to slow down. That alpine lake that you visited with your family when you were a child will have the same mountains around it when you take your own children there. It will have the same adventure-seeking type of people, and the same fresh air. No matter what else changes, there’s comfort in that. Whether it’s a run through your old town or a hike to the backcountry, find some time to just breathe. Time is going to move at the same pace no matter what. The only thing we can do control is how fast we’re rushing through each moment. Living in the past may be a waste of time, but popping in for a quick visit can give you a clearer look of where you’re headed. The leaves are changing colors, the temps are dropping, and people everywhere are renewing their annual interest in all things pumpkin-spiced. It’s Fall, and it’s a gorgeous time of the year over here in Central Oregon. When I lived in the rainy parts of both Oregon and Washington, namely Eugene and Olympia, everyone joked that we only had two seasons: Rainy Season and August. But over here on the east side of the mountains, we have seasons. Real seasons. Summer is hot and sunny with hardly any precipitation. Fall is crisp and clear, with just enough moisture to give the mountains a light dusting of snow. 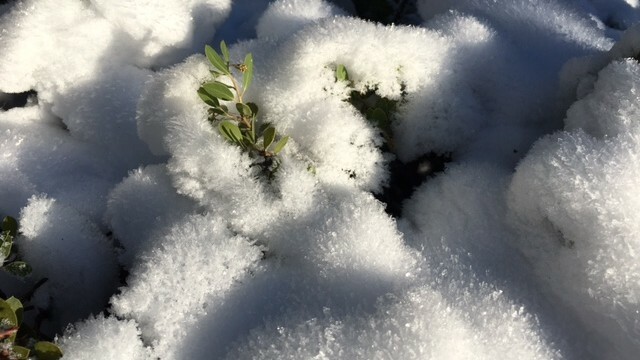 As fall progresses, the snow starts to dump, piling up throughout the cold (but often still sunny!) winter. Spring is probably the wettest, as milder temperatures begin to melt away at the snow, filling our lakes and rivers as we head back into summer. This perfect template of what seasonal transitions should look like is one of the many reasons I absolutely love living here. There’s always a big change to look forward to. I’m usually a season ahead, always mentally fast-forwarding in anticipation of everything I love about the next one. But Fall is the exception. Autumn lasts for three months, but somehow it never seems quite as long as the rest of the seasons. There’s a small window of time between late September and late October where everything magical about the outdoors converges into what I like to call hiking’s prime time. My favorite aspects of hiking are the solitude, the scenery, and simply enjoying exercise in the fresh air. All three of these features are amplified during this amazing month-long stretch . When school starts, the trails’ summer influx drives home or heads indoors, leaving even the most popular hiking routes nearly empty. 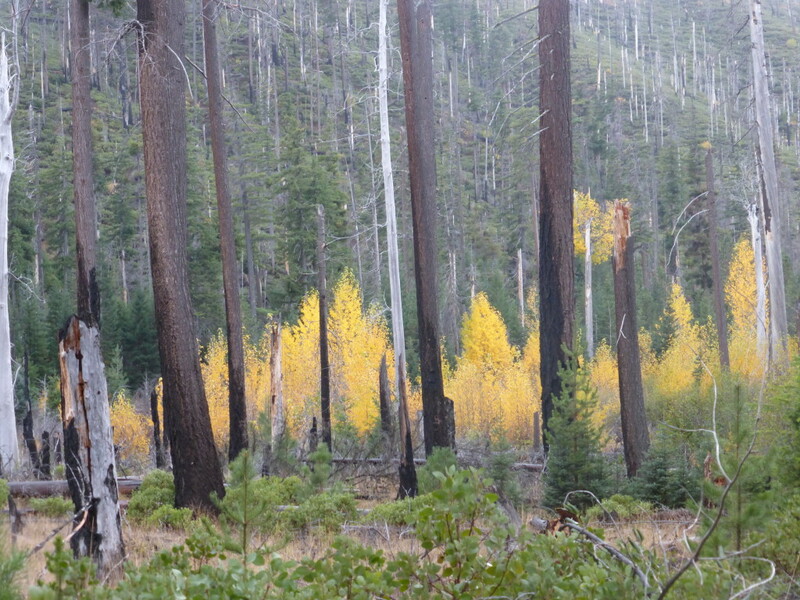 Stunning Autumn color adorns the trails, providing a last hurrah before winter snow blankets everything in white. The cooler temperatures make working up a sweat a little more inviting, too. Most of the hungry mosquitoes have even died off by this time of year. Where to go? I’d suggest heading to higher elevations that are inaccessible in the winter. Good options in Central Oregon would be anywhere in the Mt. Jefferson or Three Sisters Wilderness areas. 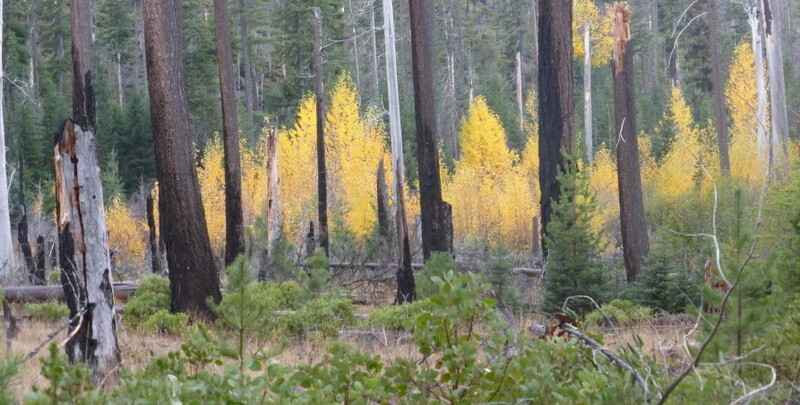 If you feel like staying near Bend, the aspens at Shevlin Park put on a stunning show during this time of year. I know it’s tempting to swap your hiking boots for ski boots and start praying for snow, but don’t. We’re smack dab in the middle of hiking season’s prime time. Don’t miss it. Hi! 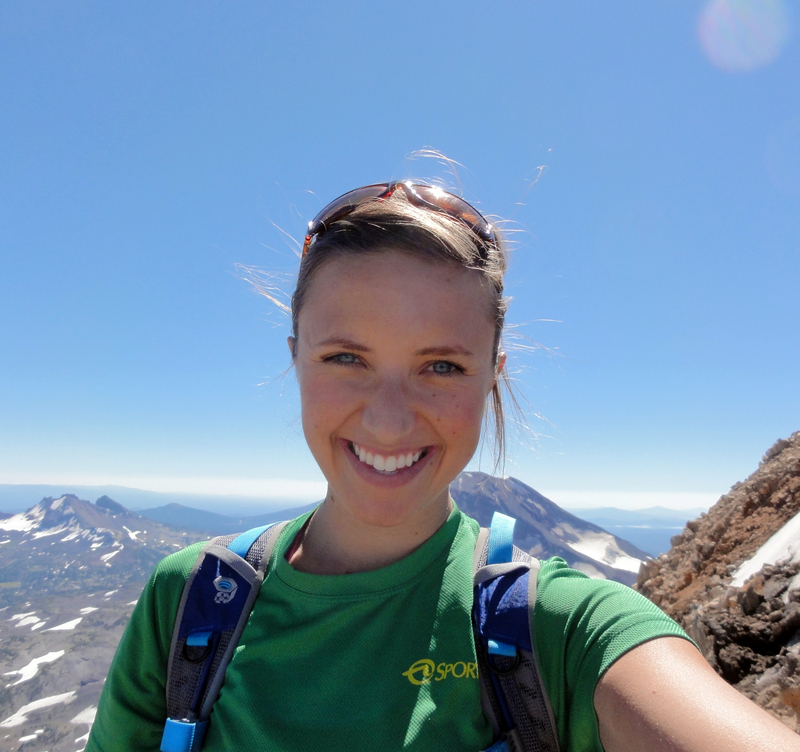 I'm Brittany Manwill, author of Day Hiking Central Oregon. Thanks for stopping by. © 2015 Brittany Manwill. All Rights Reserved.